Seiga-ken no Sanbushō was born in Seiga-ken (Qinghe xian), later becoming a 'gyōja', a Buddhist ascetic. He was much too fond of saké which frequently made him fighting drunk. 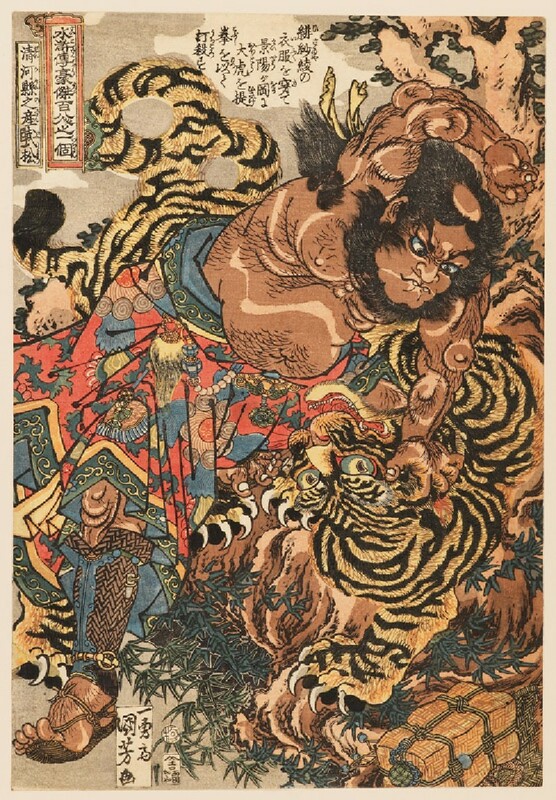 On one occasion, Sanbushō, wearing his trade-mark red clothing and having drunk too much at a saké bar in Keiyōtō (Jingyanggang) was offered a bed by the landlord as there was a tiger lurking in the area that had already killed twenty-five people. Sanbushō laughed, ignored the innkeeper and left the bar. As expected, the infamous tiger appeared, and attacked Sanbushō. After a long and bloody battle, he finally killed the beast with his bare hands. In this print, Sanbushō, who is firmly holding the tiger with his left hand, clenches his right fist and is about to give a blow to the tiger's head. This exploit became famous and he was rewarded by a local lord; he divided the prize-money among the local hunters, and thereafter became head of the lord's garrison. The Suikoden (Tales of the Water Margin ) is the Japanese translation of a Chinese novel about a band of brigands fighting against the corruption of their rulers. 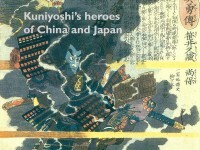 The story became popular in Japan in the nineteenth century. Sanbushō (Chinese: Wu Song) thought he had killed a man in his village, so went into hiding for a year in a nearby province. He was evicted from his lodgings for drunken behaviour and was returning home at night along a lonely mountain path when he was attacked by a tiger. Despite being inebriated, he fought the animal and eventually managed to kill it with one blow of his huge fist. This scene is also depicted on the netsuke EA2001.109.